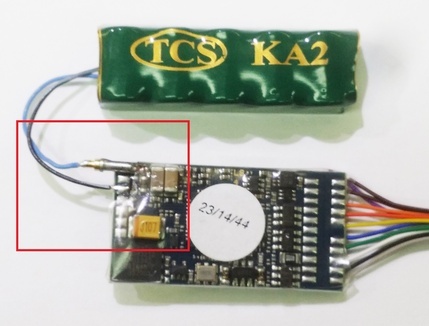 SBS4DCC - ESU LokSound V4.0 and Select "Keep-Alive"
There has been a lot of discussion on the internet about adding "Keep-Alive" capacitors to sound decoders to improve performance on dirty rails or area with poor continuity like frogs and dead rail sections. ESU LokSound decoders tend to be less sensitive to these problems but can be affected by poor continuity none the less. All V4.0 and Select models of ESU LokPilot and LokSound decoders can have a "Keep-Alive" capacitor installed to improve performance. ... as well as the the many other connector variants of these basic models. The manuals for ESU decoders include a wealth of information about installing the decoders and adding ancillary components like external chuff sensors, headlights, speakers as well as capacitors. These illustrations are taken from the respective manuals and show the appropriate pads on the decoder where the capacitors are connected. A good rule of thumb is to add as much as you can fit in the model. Anything more than zero is better than nothing and currently the TCS KA-series Keep-Alives are the most powerful units available. The bottom line here is the more capacitance you add, the better the unit will perform as continuity degrades. You may also notice that ESU recommends including a resistor-diode pair in the positive leg of the capacitor. This design is also referred to as an Inrush Current Protection circuit. It is included to prevent false short-circuit detection by DCC circuit breakers and command stations. Is it required? It just depends on your application. Do you or will you ever use a DCC circuit breaker? If yes, you should probably include it. Do you have one or one hundred units equipped with "Keep-Alives"? How much total capacitance do you have installed in all of your locos and rolling stock? If you have big caps in every loco and lighted passenger car on your layout, you should probably include it. It is not required for all applications however. The TCS KA's and ESU Power-Packs include Inrush Current Protection on-board the device. These photos show the actual connections described in the wiring diagram on the decoder. You will notice I installed a Soundtraxx 810058 Mini Micro Connector on one leg of the Keep-Alive Device connection. I have had some installations where the addition of the Keep-Alive Device made it difficult to read and write to the decoder. A connector or switch is a convenient was to remove the Keep-Alive Device from the circuit for programming. The switch or connector only needs to be added to one leg of the Keep-Alive Device connection and it doesn't matter which side. Another trick I found is to allow the Keep-Alive Device to fully charge on full track power before reading or writing CV's. The programming signal gets sucked up as charging power if the capacitors are not charged and makes programming nearly impossible. 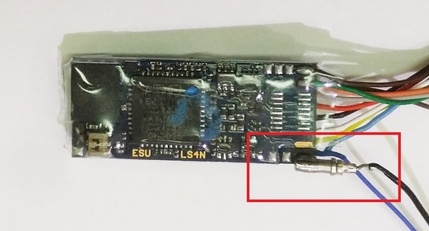 The ESU 73700 LokSound Select Direct is really just a 73800 LokSound Select Micro with a Next18 connector and adapter board. The small decoder unplugs from the main board to reveal additional solder pads on the bottom side. 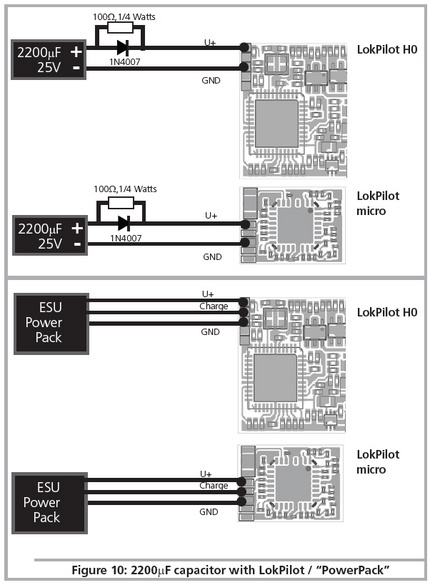 To add a Keep-Alive Device, simply use the board layout in the manual for the LokSound Micro. U+ is the blue wire. The ground pad is directly opposite U+ on the other side of the board. > the main board to reveal additional solder pads on the bottom side. It is necessary to disable Aux6 (CV315 = 0) in the Standard model decoders in order to use the Keep-Alive function. If Aux6 is enabled, the keep-alive will be effectively turned off. In LokProgrammer, V4.0 projects display a warning and link that when clicked, automatically sets CV315 = 0, thereby disabling Aux6. Select projects do not display the warning or link but the CV value and results are the same. All ESU LokSound V4.0 and Select models incorporate a timer to determine the maximum amount of time a Keep-Alive Device can supply power to the circuit. Essentially, the time limits the amount of time a Keep-Alive Device can supply power to the circuit without receiving a packet of data from the command station. I won't pretend to know every reason for needing the timer but the most obvious to me is so that the locomotive won't continue endlessly in a true power outage event. The default setting in most files is about .25 seconds. The available range is 0 to 4 seconds. CV113 = (0 - 255) where 0 is no keep-alive power and 255 is about 4 seconds of keep-alive power. Be sure to test this to determine the value that works best for your application. Here is a brief video demonstration of how CV113 works. Just a quick note about this product. 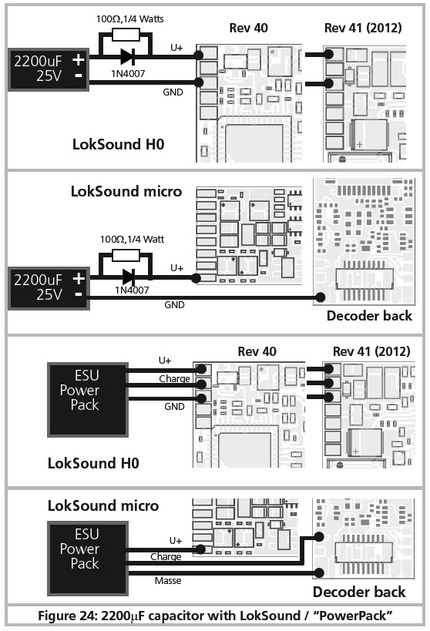 The 73700 LokSound Select Direct uses a LokSound Micro decoder that is manufactured as a four function decoder plus two additional logic level functions. The standard functions are F0F, F0R, AUX1, AUX2. AUX3 and AUX4 are logic level outputs that require transistors to amplify the output current in order for them to be used to power LEDs. The adapter board for the 73700 LokSound Select Direct includes the necessary components to amplify the AUX3 and AUX4 outputs and not the decoder. Products like my AUX 3-4 Function Board should not be used with the 73700 decoder. Additionally, the 51955 Adapter Board should be used with other decoders with caution since AUX3 and AUX4 are amplified.